I guess I should just count my lucky six-pointed Hebrew stars that that you didn’t add further insult to the character by pitting him against one of your other manga staples, the sexually-aggressive evil octopus (NSFW link, kiddies). Anyway. If you’d like to see what happens when Batman meets the insanity of giant-monster-laden Japanese manga, you might want to check out Bat-Manga! : The Secret History of Batman in Japan. It’s available in paperback and also in a limited hardcover edition, for when a volume of translated Batman manga–heretofor unknown even to DC Comics–from a single year in the 1960s just isn’t quite obscure enough. In 1966, during the height of the first Batman craze, a weekly Japanese manga anthology for boys, Shonen King, licensed the rights to commission its own Batman and Robin stories. A year later, the stories stopped. They were never collected in Japan, and never translated into English. 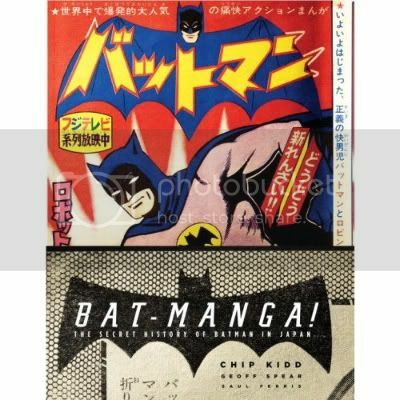 Now, in this gorgeously produced book, hundreds of pages of Batman-manga comics more than four decades old are translated for the first time, appearing alongside stunning photographs of the world’s most comprehensive collection of vintage Japanese Batman toys. Vintage Japanese Batman toys? Count me in for a fully-articulated Go-Go The Magician figure.